This recall involves 30,000 Metal Futon Bunk Beds sold at Big Lots, of Columbus, Ohio. Children behind the futon or in the ladder area of the bunk bed can get entrapped when the futon and its metal frame are lowered from the seated to the flat position. The weight of the futon’s metal frame can prevent a child from breathing and escaping. The bunk beds have an additional hazard. The space between the last rung on the bunk bed’s ladder and the futon mattress is too small, which can allow a child’s body to pass through, but not the head, posing a head and neck entrapment hazard. 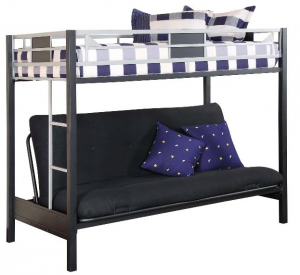 The metal futon bunk beds have an upper bunk designed to hold a twin mattress. The bottom bunks have a convertible futon bed. The recall involves metal futon bunk beds with model number BFB1008 located on a label on the upper bunk support rail. The recalled metal futon bunk beds were sold exclusively by Big Lots stores nationwide from January 2009 through April 2010 for about $200. They were sold unassembled, and were manufactured in China. Consumers should immediately stop using these bunk beds and contact Big Lots for a free repair kit that contains new ladders and other parts that consumers can install at home. Be sure to check out more info on the Big Lots Bunk Bed recall on the U.S. Consumer Product Safety Commission’s website.